The 5:2 diet is all the rage in the UK, but is it any good? An unqualified yes on my part. I’ve read hundreds of studies on fasting; I personally have been doing the so-called 5:2 diet for the last 40 years, and fasting has been practised by many cultures for millennia. But just because I have been fasting and it is an ancient religious tradition doesn’t necessarily mean it is a good thing. What is important is that research into fasting in recent years backs up the age-old idea that fasting is beneficial on many different levels. What exactly is the 5:2 diet? It is a type of intermittent fasting where you fast for 2 days every week. 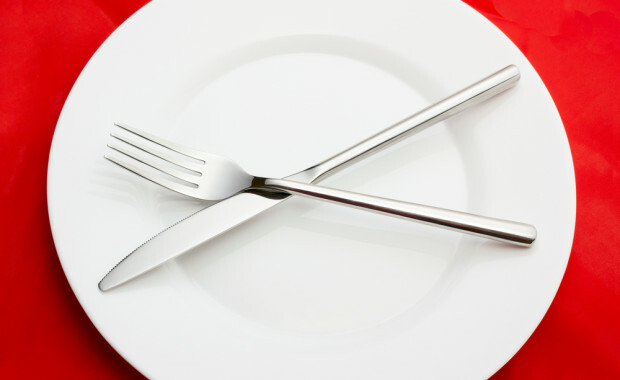 And what exactly is intermittent fasting? It is a pattern of eating that alternates between periods of fasting (usually meaning consumption of water only) and non-fasting. Fasting is easy – you just don’t eat for a prescribed amount of time. No complicated calorie counting, no avoiding of certain foods, no time consuming difficult recipes, no worries about low-fat or low-carbohydrate foods; a simple and straightforward ‘don’t eat’. But you do have to avoid compensatory gorging on non-fasting days. (If you are diabetic or on medication, I wouldn’t recommend fasting unless you have consulted your doctor and get the all clear). Improves blood pressure, cholesterol and triglyceride levels. Improves fasting blood sugar and insulin sensitivity, (the latter appears to be key in preventing and treating many Western diseases). (Last one isn’t true – my youngest son made it up. He has also tried fasting and is a convert. I’ve been fasting for decades, and it had no influence on my children; their father decides late in life to start fasting and within months all three of our sons are convinced of its benefits and take it up. I need to improve my persuasion skills). Hunger (usually only if you are not used to fasting – one does eventually get used to it and can ignore hunger pangs after a while). Might be construed as anti-social if you are invited out for a meal and don’t eat whilst all around you are eating yummy food. Difficult to institute if you are on certain medications. If you fast as well as restrict calories considerably, they could together impact fertility negatively. My brand of fasting is slightly different to that of Dr Mosley, who popularised it on a BBC Horizon programme – his method involves calorie counting, whereas mine just involves not eating for between 18 and 24 hours.But remember to avoid compensatory gorging on non-fasting days. Fasting has probably been the main factor that’s kept my weight more or less in check for most of my adult life – sadly probably more rather than less. Why a minimum of 18 hours of no food? Because science tells us that the benefits of fasting start kicking in after about 18 hours of abstinence from food. I fast on Mondays and Thursdays – Monday is good to atone for any weekend excesses, and Thursday is in anticipation of possible forthcoming weekend excesses. The night before my fasting days I have a normal supper at about 7pm, and then on the fasting days I eat only one meal (of unlimited calories!) any time between 4pm and 7pm – I try and hold off until 7pm, but sometimes the hunger pangs take over and I give in earlier. Or think of it as eating one meal in a day, and skipping two meals. You can do whatever suits you – some people have a big breakfast and then skip lunch and dinner, but that wouldn’t work for me. I end up feeling hungrier all day when I have breakfast. Occasionally I skip breakfast and dinner, and have just lunch, but I find it difficult to sleep on an empty stomach. Also, I eat only vegetarian food on my two fasting days because originally my fasts started out as Hindu fasts; now it’s become a habit to be vegetarian on these two days. Probably not a bad idea to be vegetarian sometimes – recent evidence suggests certain types of protein restriction are associated with longevity – more on this to come in the ‘calorie restriction’ post. (Probably better to call it ‘methionine restriction’). Final reminder – remember to avoid compensatory gorging on non-fasting days. Every few years I try giving up on fasting for a month or so, and my weight goes up by a couple of kilos. I then see the error of my ways and go back to fasting and to my ‘normal’ weight. Now that all around me are fasting it is much easier to do. People don’t think I’m mad anymore when I decline lunch or dinner invitations because it’s one of my fasting days. Posted in Health & Nutrition, Home Page, News and tagged 5:2 diet, Diet, Fasting. Fruit juice can have a considerable amount of calories, so strictly speaking you would be breaking your fast if you were to have it on a fasting day (although I know that in Hindu religious fasts fruit is allowed). When making fruit smoothies, the blender blades destroy the insoluble fibre in fruit. And fruit juices have neither soluble nor insoluble fibre – the physiological effect of drinking fruit juice is similar to having any sweet drink – your body gets a rapid rush of sugar without fibre (the fibre in whole fruit normally slows down the absorption of sugar so you don’t get that same ‘hit’ which is one of the main problems with all concentrated forms of sugar in food or drinks). More to follow on the perils of juices in the ‘fructose’ post. 2 meals a day seems to be generally a good idea – I presume you had a look at the post about it? Good luck with the 5:2 diet! I’m going to try the 5:2 diet , I’m already at 2 meals a day because of my Hiatal H ., my second meal is ‘Lunner’ between Lunch and Dinner. Question: So, is fresh fruit juice construed as a Meal or beverage? I make my own blend of fruits for juices, which is quite filling. Good one, Dr. Madhvi, but I think I will stick to my own plan….works for me! Fasting seems to be all the rage at the moment. All of the feedback that I’ve had in the first 24 hours of going live has been about fasting. Most of the scientific research on fasting involves abstaining from all calories for a minimum of 18 hours, so you are allowed to drink water; black coffee and tea have so few calories that they don’t affect the physiological benefits of fasting. What you consume when you break your fast seems to be irrelevant; the real benefits of fasting are obtained during the period of abstinence, so yes, wine is allowed when you break your fast. My brand of fasting and most of the experiments on fasting don’t involve calorie counting – I personally just eat until I feel full when I break my fast, and I try not to over-compensate by gorging on non-fasting days. As far as exercise is concerned, most of the research has been done on people during Ramadan. For non-competitive sports Ramadan style fasting doesn’t seem to make a significant difference to performance, but there haven’t been any studies on professional athletes and fasting to date. A few studies on rats and fasting show that occasional mild stresses such as fasting can prevent or reverse ageing (‘hormetic changes’ is the scientific term). Some people find lethargy and feeling cold big downsides to fasting. I certainly wouldn’t recommend marathon training and fasting at the same time. It’s entirely a personal choice how often you fast. Doing it regularly but then occasionally lapsing whilst on holiday is definitely better than not fasting at all. Looking forward to hearing how you get on with fasting. Three different people told me about the 5:2 diet today (maybe they are trying to hint at something). I’m thinking of trying it from next week and if it works for me I’ll stick to it. Don’t laugh at the first one, but can you drink (one glass of) wine on a fasting day with your meal? Secondly, how does fasting impact exercise? I presume most people feel a bit more tired and lethargic than usual on fasting days. Finally, what happens when you go on holiday? Can you juggle fasting days round or does that impact the health benefits?